Home › Home and Kitchen › Stainless Steel Kitchen Tongs Set Of 2 (9 Inch & 12 Inch) Salad Serving & Gri.. Stainless Steel Kitchen Tongs Set Of 2 (9 Inch & 12 Inch) Salad Serving & Gri..
NOT ALL TONGS ARE MANUFACTURED THE SAME. THESE ARE PREMIUM QUALITY INDUSTRIAL STRENGTH NO NONSENSE SET OF TONGS. THESE TONGS WILL NOT RUST OR FLAKE ANY TIME SOON. 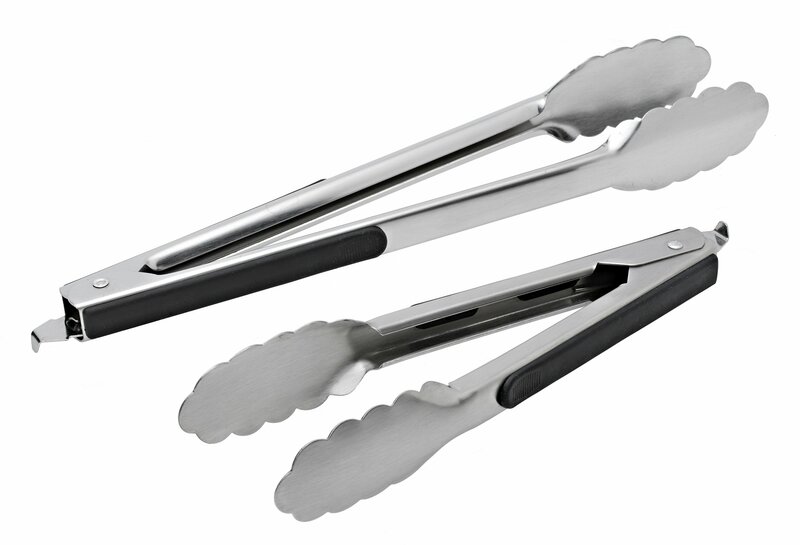 HEAVY DUTY TONGS CONSTRUCTED FROM 1mm THICK STAINLESS STEEL WITH A SUPER STRONG SPRING. ERGONOMICALLY DESIGNED KITCHEN TONGS WITH NON SLIP HEAT RESISTANT HANDLES. SERVING TONGS USED IN BOTH RESTAURANTS & HOME KITCHEN. EASY TO CLEAN DISHWASHER SAFE. Tongs. A pair of stainless steel locking kitchen tongs. Essential kitchenware for the modern kitchen. - NOT ALL TONGS ARE MANUFACTURED THE SAME. - Reduce the risk of burns & spreading germs. - Heavy duty constructed from 1mm thick stainless steel with a super strong spring. - Ergonomically designed utensils with heat resistant non slip rubber handles. - Used for food preperation in both commercial & home kitchens. - Easy locking mechanism locks in closed position for easy storage. - Easy to clean,dishwasher safe. If you have been searching for a AWESOMLEY COOL LOOKING SUPERIOR quality pair of tongs,THEN SEARCH NO MORE, these will last you for years, we ABSOLUTELY HAVE NO DOUBT you will not be dissappointed, BEST TONGS your money can EVER buy. These are premium quality industrial strength products. We are so confident in our Tongs, we have backed them with UMME's lifetime warranty under normal use. These are tongs, made to last, they do what tongs do. LIFT, GRIP, TOSS, FLIP. SELLING AT A REDUCED PRICE FOR LIMITED TIME ONLY.BUY NOW.